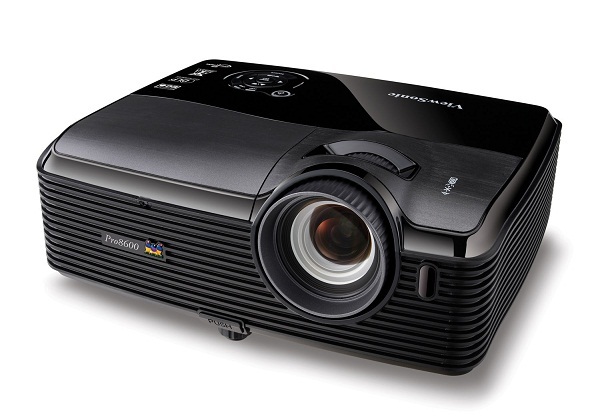 ViewSonic Corp. continues the pioneering in the projector segment and introduces an advance high brightness projector Pro8600 to offer excellent performance for in large lecture rooms, conference rooms, and public demo rooms. The Pro8600 delivers 6,000 ANSI lumens with XGA 1024x768 native resolutions, making it shine in high ambient light environment. ViewSonic's Pro8600 is integrated with cutting-edge 6000 lumens ultrahigh brightness and 15,000:1 contrast ratio that ensures every image is crystal clear and vivid in a wide range of environments. The BrilliantColor™ technology features multi-color processing to produce stunning, vibrant colors. Unlike other technologies such as LCD which use just 3 primary colors to produce the image, the Pro8600 comes with sophisticated 5-segment color for accurate and vivid color reproduction. The Pro8600 is the optimal solution for projection in large lecture rooms, conference rooms, and public demo rooms. The Pro8600 provides maximum mounting flexibility with a 1.5x optical zoom lens, multitude of connectivity options including HDMI, LAN & USB display, optional Wi-Fi, and centralized remote management with Crestron LAN controller. The 20-watt integrated speakers are ideal for multimedia applications, videos, audio-enabled presentations. The ViewSonic Pro8600 offers seamless integration and full support for Crestron control systems, and also comes standard with the Crestron RoomView Express control software to help IT personnel managing projectors efficiently and effectively – from having full remote access and control to saving valuable time and money. Packed with 6,000 lumens and a high contrast ratio of 15,000:1 (DCR), the Pro8600 is guaranteed to be vibrant and clear, even in high ambient light environments. With its advanced network capability, the projector allows you to project up to 4 PCs at the same time with the ability to broadcast up to 8 projectors via wireless (Optional wireless adapter WPD-100 is required) or wired LAN connection. The included vsPresenter software offers complete control of your desktop screen for seamless presentation. IT admin can monitor, schedule, and manage multiple projectors remotely, as well as receive projector status alerts, with the included CrestronRoomView Express control software. You can jump start your presentations without waiting for your PC to boot up. With PC-less slideshows feature, you can enjoy your pictures or images directly from a USB flash drive without a PC. BrilliantColor technology delivers stunning, all-digital clarity with lifelike color, sharp graphics and outstanding video. The sophisticated 5-segment color wheel enriches the yellow color performance that is key to accurate and vivid color reproduction.